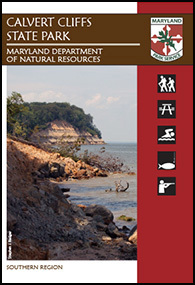 Calvert Cliffs State Park is one of the first State Parks to use the new Trail Guide format. This full color 12" x 16" guide folds down to 4" x 6" to easily fit in your pocket. Use the map to explore the park or just to find your way to the world-renowned cliffs and beach. Makes a great gift too!